Concert Video Presentations was formed as a direct result of Keith playing the inaugural concert on the rebuilt organ at St Michael's Church, Sandhurst, in 2000. 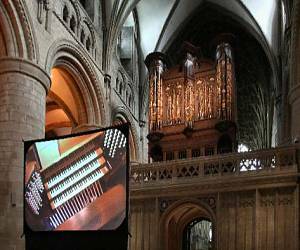 Provision had been made for a screen, camera and projector, allowing the audience views of him playing at the organ console. Comments from the audience during the interval such as "I didn't realise you used your feet to play" made me think having a big screen at all my concerts would have major benefits. Since then, the business has grown into a very successful enterprise and has helped break down the barriers between audience and performer, who is often situated totally out of sight. As you will see below it has taken us to many prestigious venues in the UK and also to the Brussels International Organ Festival on two occasions. By May 2006 the original equipment was getting very tired and outdated, and so the projector and camera were updated to being state-of-the-art high definition and the projector has a powerful 5000 lumens of light output. The business continues to grow and has recently screened at the Royal Albert Hall in London. Other recent venues include St Paul's Cathedral and Gloucester Cathedral. We very much hope to be able to help you too.